Computer systems used within the industrial sector are connected by networks known generally as Fieldbus. Fieldbus systems are a way to connect computers and instruments to a single network in a manufacturing plant and allow for real-time control and monitoring. Fieldbus industrial networks can be broken down into four levels each with increasing levels of complexity. 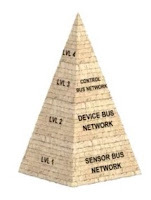 The most basic level is the sensor bus networks. Sensor bus networks are the least complex of networks developed for industrial application. In these networks, multiple basic field devices like limits witches or level optical sensors are connected to one network cable. The sensor bus network is also capable of transmitting output signals from the controller over one cable to indicator lamps, alarms, or other actuator devices. The next increasingly complex level of industrial Fieldbus networking is the device bus network. The device bus network is similar in function to the sensor bus network but works on a larger scale connecting many sensors and actuators together. 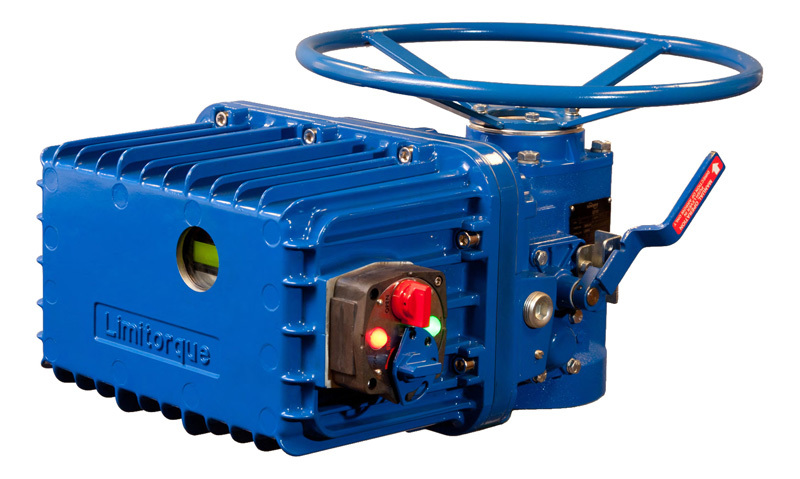 The device bus network also connects equipment to variable speed drives and motor control centers that allow for control of individual elements in the network. Moving up the pyramid, the next increasing complex level of Fieldbus networking is the control bus network. Control bus networks are the most advanced networks used on the factory floor and data communication happens at a high level. PLC's, or programmable logic controllers, are connected to each other alongside HMI's or human machine interface panels to allow for complete configuration and control of every instrument on the network. Smart instruments, capable of performing complex operations, can also be connected at this network level. 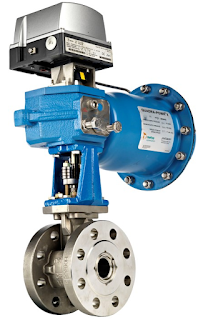 For instance, there might be a smart instrument that measures wear and tear on a valve. 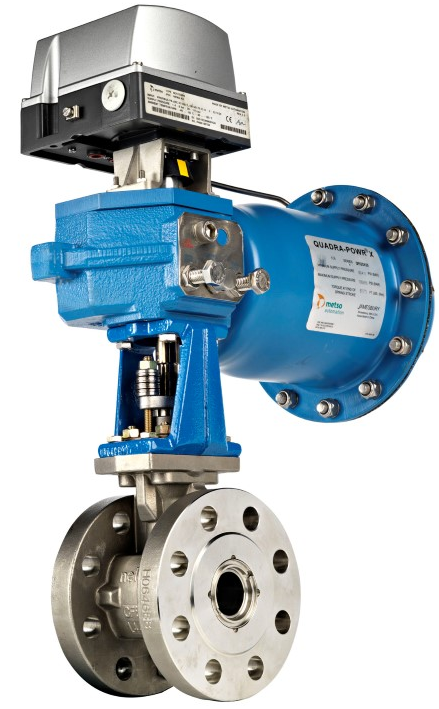 When the wear reaches a dangerous level it will signal the controller that the valve needs to be replaced. The enterprise or information level network in a company connects all computers and departments together it is the most overarching and complex of all the various network levels. This level of networking is primarily computer driven which allows for data collection, data monitoring, file transfers, and email exchange on a large scale. The various levels of interconnected Fieldbus networking help to keep industry functioning smoothly and successfully. The Mead O’Brien Instrument Shop is fully equipped to handle your instrument calibration and repair needs. Whether its repair, calibration or certification services, Mead O’Brien can handle the job. Our technicians are factory trained and certified and can repair and re-calibrate virtually any pressure and temperature transmitter, pressure gauge, pressure switch, thermometer, RTD, or thermocouple. 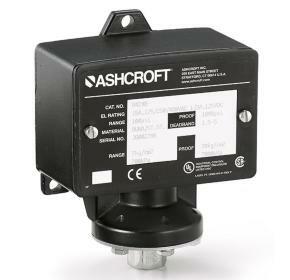 A pressure switch is a device that detects the presence of fluid pressure. Pressure switches use a variety of sensing elements such as diaphragms, bellows, bourdon tubes, or pistons. The movement of these sensors, caused by pressure fluctuation, is transferred to a set of electrical contacts to open or close a circuit. Normal status of a switch is the resting state with stimulation. A pressure switch will be in its “normal” status when it senses low or minimum pressure. For a pressure switch, “normal” status is any fluid pressure below the trip threshold of the switch. 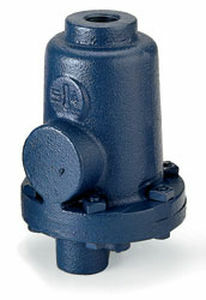 One of the earliest and most common designs of pressure switch was the bourdon tube pressure sensor with mercury switch. When pressure is applied, the bourdon tube flex's enough to tilt the glass bulb of the mercury switch so that the mercury flows over the electrical contacts, thus completing the circuit. the glass bulb tilts far enough to cause the mercury to fall against a pair of electrodes, thus completing an electrical circuit. Many of these pressure switches were sold on steam boilers. While they became a de facto standard, they were sensitive to vibration and breakage of the mercury bulb. Pressure switches using micro type electrical switches and force-balanced pressure sensors is another common design. The force provided by the pressure-sensing element against a mechanical spring is balanced until one overcomes the other. The tension on the spring may be adjusted to set the tripping point, thus providing an adjustable setpoint. One of the criteria of any pressure switch is the deadband or (reset pressure differential). This setting determines the amount of pressure change required to re-set the switch to its normal state after it has tripped. 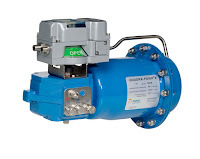 The “differential” pressure of a pressure switch should not to be confused with differential pressure switch, which actually measures the difference in pressure between two separate pressure ports. Any company that is energy conscious is also environmentally conscious. Less energy consumed means less waste, fewer emissions and a healthier environment. In short, bringing energy and environment together lowers the cost industry must pay for both. By helping companies manage energy, Armstrong and Mead O'Brien products and services are also help protect the environment. Steam is a very efficient and easily controlled heat transfer medium. It is most often used for transporting energy from a central location (the boiler) to any number of locations in the plant where it is used to heat air, water or process applications. As noted, additional Btu are required to make boiling water change to steam. These Btu are not lost but stored in the steam ready to be released to heat air, cook tomatoes, press pants or dry a roll of paper. The heat required to change boiling water into steam is called the heat of vaporization or latent heat. The quantity is different for every pressure/temperature combination, as shown in the steam tables. Heat flows from a higher temperature level to a lower temperature level in a process known as heat transfer. Starting in the combustion chamber of the boiler, heat flows through the boiler tubes to the water. When the higher pressure in the boiler pushes steam out, it heats the pipes of the distribution system. Heat flows from the steam through the walls of the pipes into the cooler surrounding air. This heat transfer changes some of the steam back into water. That’s why distribution lines are usually insulated to minimize this wasteful and undesirable heat transfer. When steam reaches the heat exchangers in the system, the story is different. Here the transfer of heat from the steam is desirable. Heat flows to the air in an air heater, to the water in a water heater or to food in a cooking kettle. Nothing should interfere with this heat transfer. 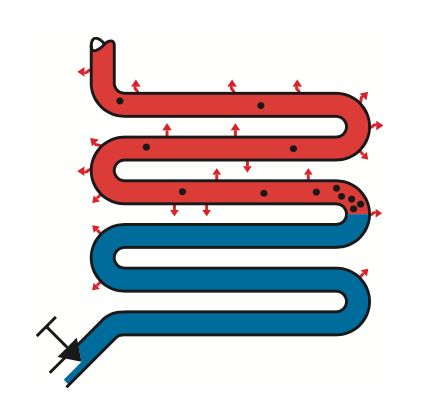 Condensate is the by-product of heat transfer in a steam system. It forms in the distribution system due to unavoidable radiation. It also forms in heating and process equipment as a result of desirable heat transfer from the steam to the substance heated. Once the steam has condensed and given up its valuable latent heat, the hot condensate must be removed immediately. Although the available heat in a pound of condensate is negligible as compared to a pound of steam, condensate is still valuable hot water and should be returned to the boiler. The document below provides and excellent reference for understanding the properties of steam and the importance of condensate drainage for an efficient system. You may also download your own copy of the Steam Conservation Guidelines for Condensate Drainage here. Steam Conservation Guidelines for Condensate Drainage from Mead O'Brien, Inc. The need to drain the distribution system. of condensate along like a battering ram. Condensate lying in the bottom of steam lines can be the cause of one kind of water hammer. Steam traveling at up to 100 miles per hour makes “waves” as it passes over this condensate (Fig. 1). If enough condensate forms, high-speed steam pushes it along, creating a dangerous slug that grows larger and larger as it picks up liquid in front of it. Anything that changes the direction—pipe fittings, regulating valves, tees, elbows, blind flanges—can be destroyed. In addition to damage from this “battering ram,” high-velocity water may erode fittings by chipping away at metal surfaces. The need to drain the heat transfer unit. When steam comes in contact with condensate cooled below the temperature of steam, it can produce another kind of water hammer known as thermal shock. Steam occupies a much greater volume than condensate, and when it collapses suddenly, it can send shock waves throughout the system. This form of water hammer can damage equipment, and it signals that condensate is not being drained from the system. Obviously, condensate in the heat transfer unit takes up space and reduces the physical size and capacity of the equipment. Removing it quickly keeps the unit full of steam (Fig. 2). As steam condenses, it forms a film of water on the inside of the heat exchanger. Non-condensable gases do not change into liquid and flow away by gravity. Instead, they accumulate as a thin film on the surface of the heat exchanger—along with dirt and scale. All are potential barriers to heat transfer (Fig. 3). The need to remove air and CO2. Air is always present during equipment start-up and in the boiler feedwater. Feedwater may also contain dissolved carbonates, which release carbon dioxide gas. The steam velocity pushes the gases to the walls of the heat exchangers, where they may block heat transfer. This compounds the condensate drainage problem, because these gases must be removed along with the condensate. must penetrate these potential barriers to do their work. For more information about any industrial steam or hot water system, contact Mead O'Brien by visiting www.meadobrien.com or call (800) 892-2769. With decades of expertise in rack and pinion and scotch-yoke actuators, as well as electric quarter-turn and linear actuators, Mead O'Brien has the experience and facilities to deliver a well engineered automated valve package. Visit www.meadobrien.com.